In this series of articles, we discuss the concepts used by wine critics when scoring wine. In doing so, we hope to provide our readers with insights for their own judgment of quality and value. 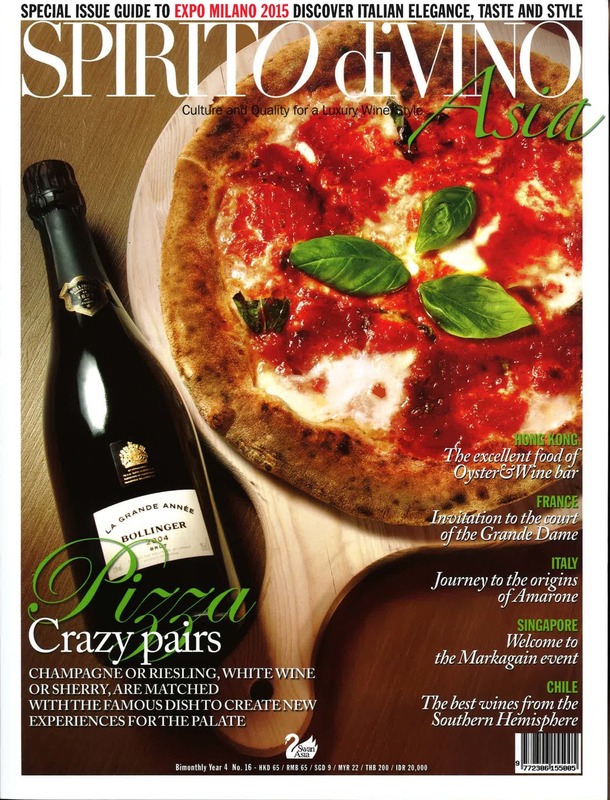 In this issue, we focus on Ageing Ability. Ageing ability is often viewed by many critics as one of the fundamental points of reference for wine quality. However, this is highly debatable for two main reasons; firstly, most wines today are actually made in a style to enjoy when young; and, secondly, not all wines can age at the same speed and for the same period of time. For example, most good quality Burgundy will reach their best after 8 to 10 years in bottle compared to top wines from Pauillac which should be drunk well within 10-15 years at most. In fact, it is only the exceptions, perhaps 1-3% of all wines, that can be aged for periods over 20-30 years and beyond. 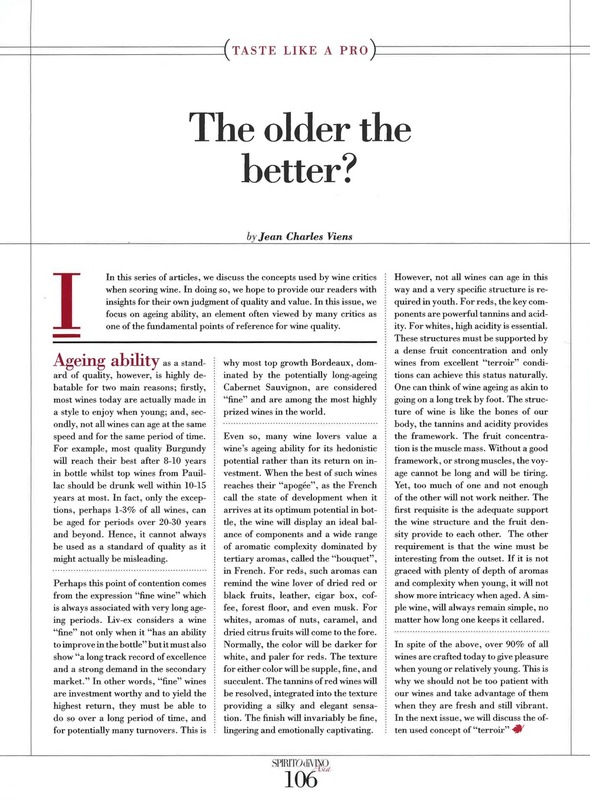 Therefore, ageing ability can not always be used as a standard of quality as it might actually be misleading. Perhaps this point of contention comes from the expression “fine wine” which is always associated with very long ageing periods. Liv-ex, a marketplace for wine trading, not only considers that a wine is “fine” when it “has an ability to improve in the bottle” but it must also show “a long track record of excellence and a strong demand in the secondary market.” In other words, “fine” wines are investment worthy and to yield the highest return, they must be able to do so over a long period of time, and for potentially many turnovers. This is why most top growth Bordeaux, dominated by the potentially long-ageing Cabernet Sauvignon, are considered “fine” and are among the most highly prized wines in the world. Even so, many wine lovers value a wine’s ageing ability for its hedonistic potential rather than its return on investment. When the best of such wines will have reached their “apogée”, as the French call the state of development when it will arrive at its optimum potential in bottle, the wine will display an ideal balance of components and a wide spectrum of aromatic complexity dominated by tertiary aromas, called the “bouquet”, in French. For red wines, such aromas can remind the wine lover of dried red or black fruits, leather, cigar box, coffee, forest floor, and even musk. For whites, aromas of nuts, caramel, and dried citrus fruits will come to the fore. Normally, the color will be darker for white, and paler for reds. The texture for either color will be supple, fine, and succulent. The tannins of red wines will be resolved, integrated into the texture providing a silky and elegant sensation. The finish will invariably be fine, lingering and emotionally captivating. However, not all wines can age in this way and a very specific structure is required in youth. For reds, the key components are powerful tannins and acidity and for whites, essential is for them to display high acidity. In addition, these structures must be supported by a dense fruit concentration and only wines from excellent “terroir” conditions can achieve this status naturally. One can think of wine ageing as akin to going on a long trek by foot. The structure of the wine is like the bones of our body, the tannins and acidity provides the framework. The fruit concentration is the muscle mass. Without a good framework, or without strong muscles, the voyage can not be long and will invariably be tiring. On the other hand, too much of one and not enough of the other will not work either. The first requisite is the adequate support the wine structure and the fruit density provide to each other. The other requirement, not mentioned until now but absolutely essential, is that the wine be interesting from the outset. If it is not graced with plenty of depth of aromas and complexity when young, it will not show more intricacy when aged. A simple wine, will always remain simple, no matter how long one keeps it cellared. In spite of the above, over 90% of all wines are crafted today to give pleasure when young or relatively young. This is why we should not be too patient with our wines and take advantage of them when they are fresh and still vibrant. After all, wine is for pleasure and whether a wine is young or aged, both style can match food brilliantly and lubricate many a conversations with good friends and family members. In the next issue, we will discuss the often used concept of “terroir” and the conditions that makes one superior over another.